Its box uses a built in magnet for the opening-closure of the box. 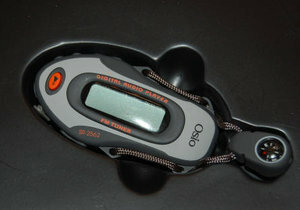 The player is put inside a b black plastic foil as shown in the picture .Under the plastic foil you can find two operating instructions booklets, a USB to Chinese mini-USB cable a mini CD and a battery. As you may see the model is quite sporty in contrast to our use. The cord includes a mini compass as ‘bonus‘. The battery is drained by the time. The model requested was 256 MB. AS it will be used speeches, it does not require standard MP3 levels.I tested today that for talks or speeches, just 16 kb on WMA (using Winamp) are enough! 22 kb WMA are sufficient for near-to-FM quality. 1. Greek as well Chinese letters in the mp3 name cannot be correctly shown.THis comes in contrast with its surely Chinese origin! In all these 3 cases the corresponding ASCIi roman character set waas shown. the resulted noise however was much distorted. Based on this , the player plays music exactly ‘as is’. But mixing WMA and MP3s together can cause the player to crash and reboot…..For this reason, i converted all MP3 files into WMA. Recording: it has 4 setting but all of them are very low quality. I could neither use it for voice recording . Winamp shown 32 kb/8 kHz for the best setting. .
As by result the MP3 player is quite good for radio and has better audio over my others but lacks good quality recording. Αναρτήθηκε από Zach Liang στις 1:14 π.μ.